These are not nearly "perfect" because I let my kids paint them, which was both a great craft project, and sweet way for them to welcome a new baby that was born to friends of ours a month ago. I'm still learning to let go when it comes to crafting. Assemble art mats (to protect your surface), empty and clean baby food jars, other large jars, and paints. Take pictures without getting paint on your camera. This part is tricky. Once they dried, I popped in some battery-operated tea lights to test them out. Lovely. And they go with my color-scheme for the baby shower! You can see my attempt for an ombre jar in the back. 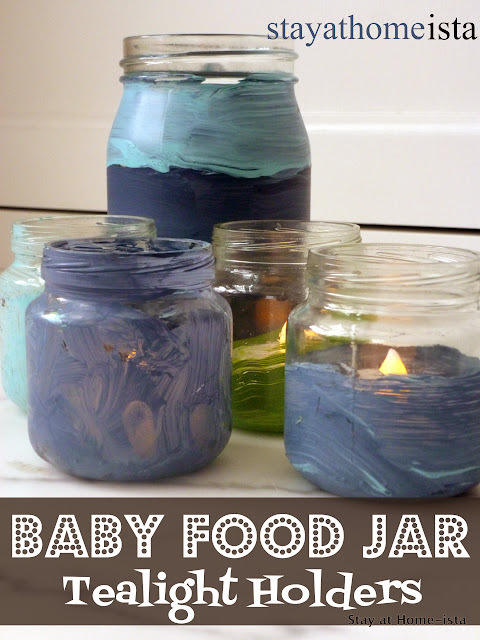 I've also spray painted baby food jars to create gold vases, that was a more professional look, but less kid-involved. Plus I turned baby food jars into kid sippers for a birthday party. My boys would love this activity! Great idea!